This issue of Dermatologic Clinics, Guest Edited by Drs. 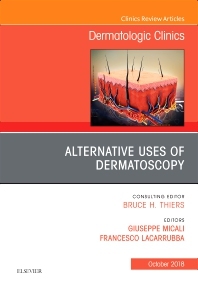 Giuseppe Micali and Francesco Lacarrubba, is devoted to Alternative Uses of Dermatoscopy. Articles in this outstanding issue include: Instruments in Dermatoscopy; Dermatoscopy of Parasitic and Infectious Disorders; Dermatoscopy of Common Inflammatory Disorders; Dermatoscopy of Granulomatous Disorders; Dermatoscopy of Lymphomas and Pseudolymphomas; Dermatoscopy of Cutaneous Vascular Lesions; Dermatoscopy of Adnexal Lesions; Trichoscopy Tips; Trichoscopy of Hair Shaft Disorders; Dermatoscopy of Nail Disorders; Dermatoscopy of Conjunctival Lesions; Dermatoscopy in Pediatric Dermatology; Dermatoscopy of Inflammatory Genital Diseases: Practical Insights; Dermatoscopy in Brown Skin; and Dermatoscopy and Reflectance Confocal Microscopy Correlations.